Cas Holman, assistant professor of industrial and interaction design in the College of Visual and Performing Arts’ Department of Design, had her design for the Children’s Workyard Kit, a custom play feature for the High Line on Manhattan’s West Side, win Design Distinction in the consumer products category of I.D. Magazine’s Annual Design Review. 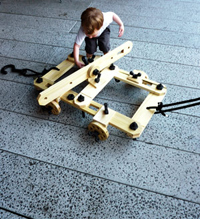 Designed to reflect the High Line site’s industrial history, the Children’s Workyard Kit features custom-made wood planks, wheels, ropes, canvas, pulleys, tools and found objects that inspire children to construct their own play and build their own visions. Holman developed the kit in collaboration with early learning educators and Friends of the High Line. Since 1954, I.D. Magazine’s Annual Design Review has recognized the best in product, furniture and graphic and environment design and is one of the most prestigious competitions in the industry. Holman is an award-winning designer/inventor and founder of Heroes Will Rise, a toy company that designs toys and spaces for exploratory, unstructured play.